Download "Econ 202 H01 Final Exam Spring 2005"
1 Econ202Final Spring Econ 202 H01 Final Exam Spring Which of the following tends to reduce the size of a shift in aggregate demand? a. the multiplier effect b. the crowding-out effect c. the accelerator effect 2. Which of the following shifts both short-run and long-run aggregate supply to the right? a. an increase in the actual price level b. an increase in the expected price level c. an increase in the capital stock d. an increase in government expenditures. 3. In the long run, which of the following would shift the LONG-RUN Phillips curve to the right? a. an increase in the minimum wage b. an increase in the money supply c. a decrease in the money supply d. tax cuts 4. 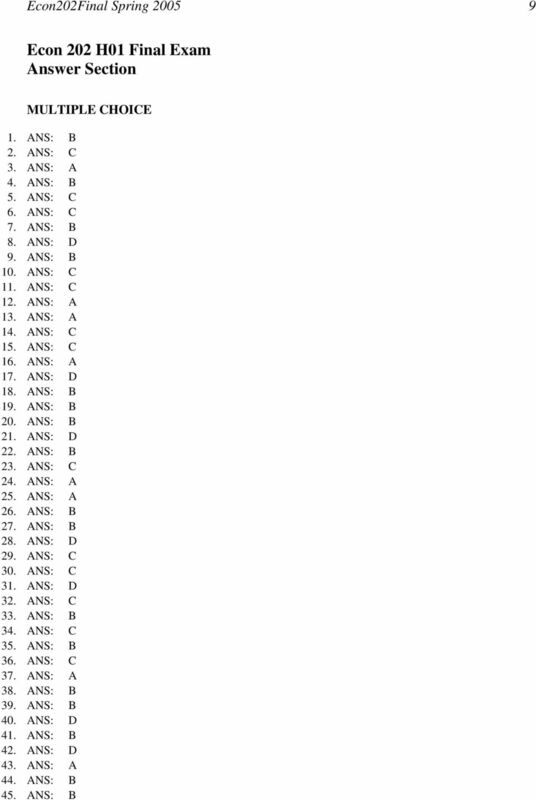 Based on the quantity equation, if M = 100, V = 3, and Y = 200, then P = a. 1. b c. 2. Table 11-2 year price of pork price of corn 2003 $20 $ $20 $30 5. Refer to Table Suppose that the basket of goods in the CPI consisted of 3 units of pork and 2 units of corn. What is the inflation rate for 2004? a percent b. 25 percent c. 20 percent d. 15 percent 6. In the long run, the inflation rate depends primarily on a. the ability of unions to raise wages. b. government spending. c. the money supply growth rate. d. the monopoly power of firms. 7. An increase in expected inflation shifts a. only the long-run Phillips curve right. b. only the short-run Phillips curve right. c. neither the short-run nor long-run Phillips curve right. d. both the short-run and long-run Phillips curve right. 8. In the open-economy macroeconomic model, the demand for loanable funds comes from a. domestic investment. b. net exports. c. net capital outflow. d. the sum of net capital outflow and domestic investment. 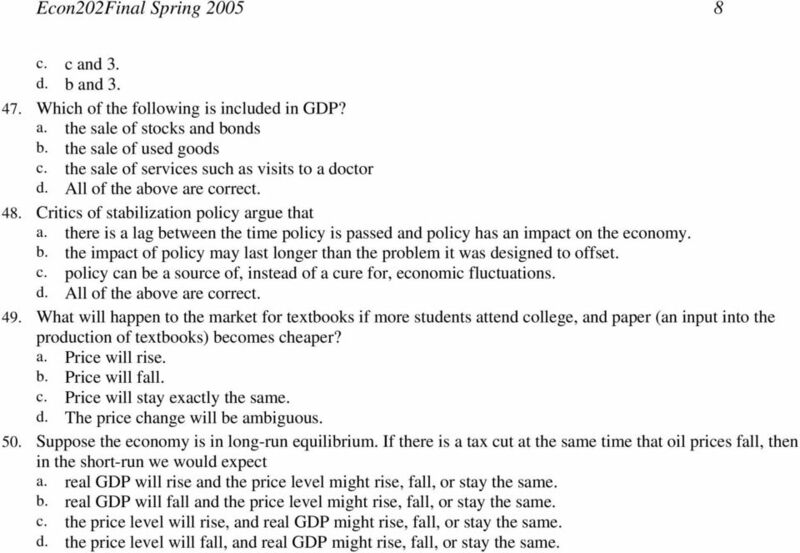 2 Econ202Final Spring Which of the following would cause prices and real GDP to rise in the short run? a. an increase in the expected price level b. an increase in the money supply c. an increase in the capital stock d. a tax increase. 10. Which of the following would result in an increase in equilibrium price and an ambiguous change in equilibrium quantity? a. an increase in supply and demand b. an increase in supply and a decrease in demand c. a decrease in supply and an increase in demand d. a decrease in supply and demand 11. An economic contraction caused by an AD shift corrects itself over time as the expected price level a. rises, shifting aggregate demand right. b. rises, shifting aggregate demand left. c. falls, shifting aggregate supply right. d. falls, shifting aggregate supply left. 12. Which of the following is included in the demand for dollars in the market for foreign-currency exchange in the open-market macroeconomic model? a. A firm in Kenya buys wheat from a U.S. firm. b. A Japanese bank purchases U.S. Treasury securities. c. An U.S. citizen buys a bond issued by a Mexican corporation. 13. If the government of India reduces its budget deficit, the real exchange rate of the rupee would a. depreciate and Indian net exports would rise. b. depreciate and Indian net exports would fall. c. appreciate and Indian net exports would rise. d. appreciate and Indian net exports would fall. 14. An economic contraction caused by a leftward shift in aggregate demand causes prices to a. rise in the short run, and rise even more in the long run. b. rise in the short run, and fall back to their original level in the long run. c. fall in the short run, and fall even more in the long run. d. fall in the short run, and rise back to their original level in the long run. 15. Ceteris paribus, as the price level rises, dollars become a. more valuable, and interest rates rise. b. more valuable, and interest rates fall. c. less valuable, and interest rates rise. d. less valuable, and interest rates fall. 16. Which of the following is not an automatic stabilizer? a. the minimum wage b. the unemployment compensation system c. the federal income tax d. the welfare system 17. An early frost in the vineyards of California s Napa Valley wine country would cause a. an increase in the demand for wine, increasing price. b. an increase in the supply of wine, decreasing price. c. a decrease in the demand for wine, decreasing price. d. a decrease in the supply of wine, increasing price. 18. According to liquidity preference theory, equilibrium in the money market is achieved by adjustments in a. the price level. 3 Econ202Final Spring b. the interest rate. c. the exchange rate. d. real wealth. 19. Which of the following would NOT shift the demand curve for peanuts? a. a change in income b. a change in the price of peanuts c. a change in expectations about the future price of peanuts d. a change in the price of cashews For the following questions, consult the diagram below: Figure Refer to Figure If the current interest rate is 2 percent, a. there is excess money supply. b. people will try to increase their money holdings, which drives interest rates up. c. as the money market moves to equilibrium, people will buy more goods. 21. In 2002, the United States imposed restrictions on the importation of steel into the United States. Our openeconomy macroeconomic model shows that such a policy would a. lower the real exchange rate and increase net exports. b. lower the real exchange rate and have no effect on net exports. c. raise the real exchange rate and decrease net exports. d. raise the real exchange rate and have no effect on net exports. Table 3-3 Labor Hours Needed to Make One Unit of: Baskets Birdhouses Montana 6 2 Missouri Refer to Table 3-3. Montana has a comparative advantage in a. baskets and Missouri has a comparative advantage in birdhouses. 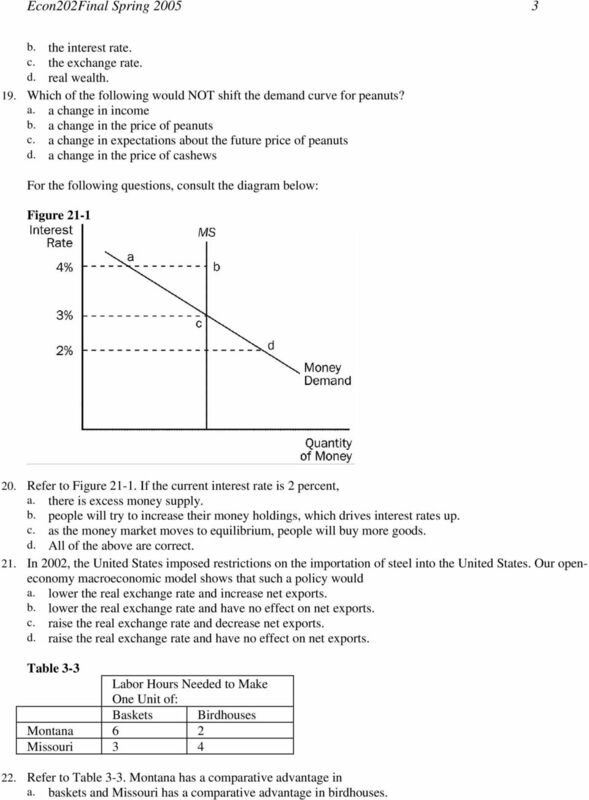 6 Econ202Final Spring Figure Refer to Figure Which of the following is consistent with capital flight from Mexico? a. The real exchange rate of the peso appreciates from E 0 to E 1. b. The real exchange rate of the peso depreciates from E 0 to E 1. c. The real exchange rate of the peso appreciates from E 1 to E 0. d. The real exchange rate of the peso depreciates from E 1 to E Aggregate demand would shift to the right if a. the price level decreased. b. the government began charging a new tax on investments. c. government expenditures increased. d. a and c are both correct 37. Julio, Paul, and James each currently has $1 million in savings. Julio will retire in ten years and gets 5 percent interest. Paul will retire in five years and gets 10 percent interest. James will retire in two years and gets 25 percent interest. With compounding, who will have the most dollars when he retires? a. Julio b. Paul c. James d. They all retire with the same amount. 38. Comparative advantage reflects a. productivity. b. relative opportunity cost. c. efficiency. d. terms of trade advantage. 39. If a country's imports are greater than its exports, the country is said to have a a. trade surplus. b. trade deficit. c. comparative advantage. d. absolute advantage. 40. The opportunity cost of holding money a. decreases when the interest rate increases, so people desire to hold more of it. 7 Econ202Final Spring b. decreases when the interest rate increases, so people desire to hold less of it. c. increases when the interest rate increases, so people desire to hold more of it. d. increases when the interest rate increases, so people desire to hold less of it. 41. According to Milton Friedman, if policymakers expand aggregate demand, a. in the long run, prices will be higher and unemployment will be lower. b. in the long run, prices will be higher and unemployment will be unchanged. c. in the long run, inflation and unemployment will be unchanged. 42. From 1980 to 1987, U.S. net capital outflows decreased. According to the open-economy macroeconomic model, which of the following could have caused this? a. an increase in the demand for U.S. currency in the foreign-currency exchange b. a decrease in the demand for U.S. currency in the foreign-currency exchange c. an increase in national savings d. a decrease in national savings 43. If a country went from a government budget deficit to a surplus, a. national savings would increase shifting the supply of loanable funds right. b. national savings would increase shifting the supply of loanable funds left. c. national savings would decrease shifting the demand for loanable funds right. d. national savings would decrease shifting the demand for loanable funds left. 44. Assume that the MPC is 0.60, or 3/5. Assuming that there is no crowding out, a DECREASE in government purchases of $10 billion will shift the aggregate demand curve a. left by $10 billion. b. left by $25 billion. c. right by $25 billion. 45. What part of the Fed meets every six weeks to discuss changes in the economy and determine monetary policy? a. the Board of Governors b. the FOMC c. the regional Federal Reserve Bank presidents d. the Central Bank Policy Commission. Figure Refer to Figure If the economy starts at c and 1, then in the short run, an increase in government spending moves the economy to a. a and 1. b. b and 2. 8 Econ202Final Spring c. c and 3. d. b and Which of the following is included in GDP? a. the sale of stocks and bonds b. the sale of used goods c. the sale of services such as visits to a doctor 48. Critics of stabilization policy argue that a. there is a lag between the time policy is passed and policy has an impact on the economy. b. the impact of policy may last longer than the problem it was designed to offset. c. policy can be a source of, instead of a cure for, economic fluctuations. 49. What will happen to the market for textbooks if more students attend college, and paper (an input into the production of textbooks) becomes cheaper? a. Price will rise. b. Price will fall. c. Price will stay exactly the same. d. The price change will be ambiguous. 50. Suppose the economy is in long-run equilibrium. If there is a tax cut at the same time that oil prices fall, then in the short-run we would expect a. real GDP will rise and the price level might rise, fall, or stay the same. b. real GDP will fall and the price level might rise, fall, or stay the same. c. the price level will rise, and real GDP might rise, fall, or stay the same. d. the price level will fall, and real GDP might rise, fall, or stay the same. 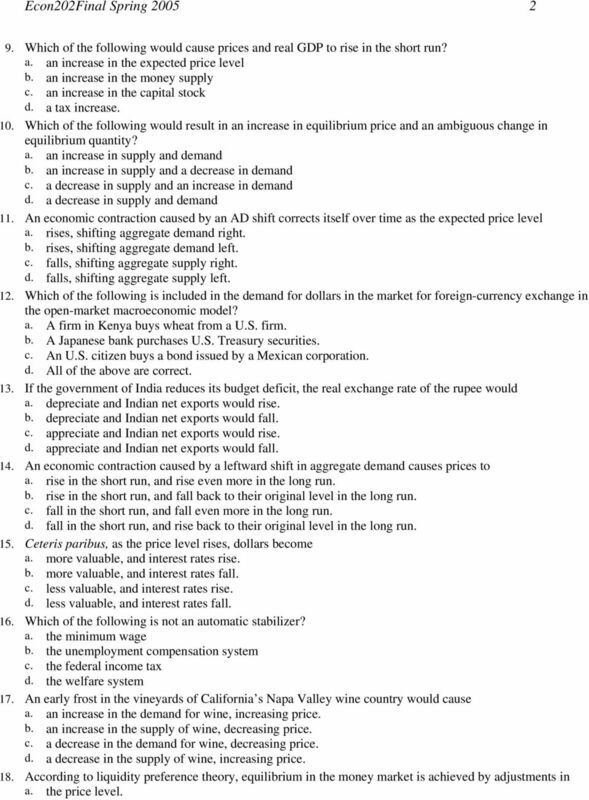 11 Econ202Final Spring Short Answer: Answer in the space provided. Use the back of the page if necessary. 1. Draw a short-run Phillips Curve on the axes below. Be sure to label the axes. The US economy is currently at (very roughly) 5% unemployment and 2% inflation. Label this point on your Phillips curve with a dot, marked A. a. Samuelson and Solow ( S&S ) claimed that the Phillips Curve offers policy makers a menu of possible levels of unemployment and inflation. If the Federal Reserve wants to reduce the rate of inflation, it should (reduce, increase) the rate of money supply growth, perhaps by (buying, selling) bonds. According to S&S, this policy will (raise or lower) the unemployment rate. Show the new point, labeled B on the above graph, that S&S predict the economy will go to if the Fed follows this anti-inflationary policy. b. An article in last Friday s WSJ article predicts that both unemployment and inflation will increase if the Federal Reserve leaves the economy alone. Show a point, labeled C on the graph above, that the economy might move to if this prediction is correct. This prediction implies that the Phillips Curve must be shifting to the (left, right). Explain why it might be shifting in this direction right now. 2. 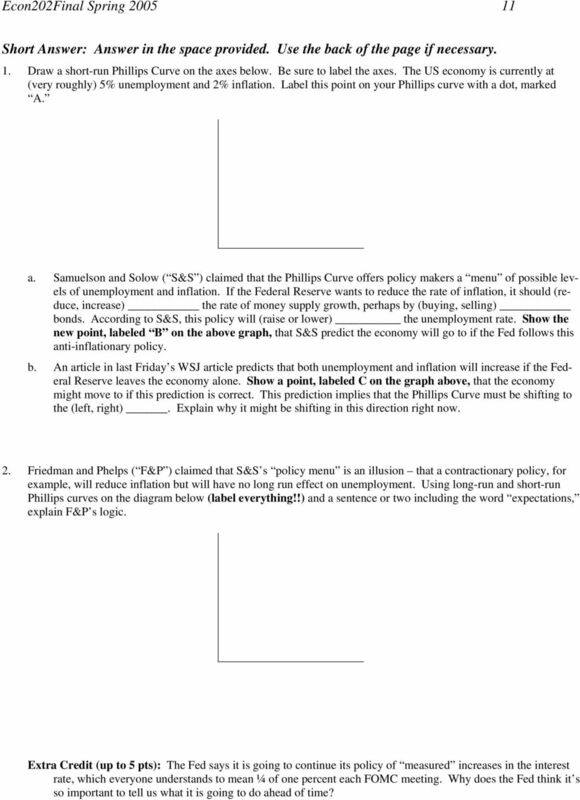 Friedman and Phelps ( F&P ) claimed that S&S s policy menu is an illusion that a contractionary policy, for example, will reduce inflation but will have no long run effect on unemployment. Using long-run and short-run Phillips curves on the diagram below (label everything!!) and a sentence or two including the word expectations, explain F&P s logic. Extra Credit (up to 5 pts): The Fed says it is going to continue its policy of measured increases in the interest rate, which everyone understands to mean ¼ of one percent each FOMC meeting. Why does the Fed think it s so important to tell us what it is going to do ahead of time? 21 THE SHORT-RUN TRDEOFF ETWEEN INFLTION ND UNEMPLOYMENT LERNING OJECTIVES: y the end of this chapter, students should understand: why policymakers face a short-run tradeoff between inflation and unemployment. The course is very similar to the microeconomics and macroeconomics principles courses offered at the college level. Problem Session II. May 9th, Reference: Parkin, Introduction to economics, 2011. Problem Session II May 9th, 2014 Reference: Parkin, Introduction to economics, 2011. Important Note: Please contact to your professor about which chapters are included in the midterm and nal exams. 1.